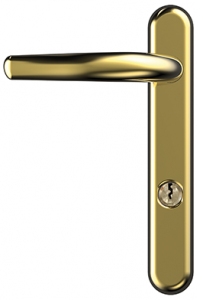 The MAX6MUM SECURITY high security front door handle has been developed not only to look professional and attractive on your door, but they also help to stop advanced attack methods used by burglars in the community today! 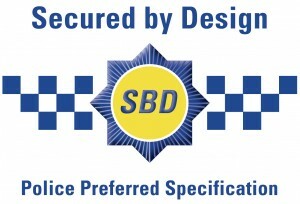 Not only has this high security front door handle been awarded ‘Secured by Design’ – the Police preferred specification, it has also passed extensive testing from BSi Kitemark, and achieved a TS007:2012 2 star Kitemark rating! What Size Handle Do I Need? The self adhesive backing tabs are featured on both the internal and external handle adding to the attack resistance, and also helping to assist easy fitting. The self-adhesive tabs also aid in preventing water from penetrating between the door and handle, thus preventing corrosion, discoloration, and premature aging. 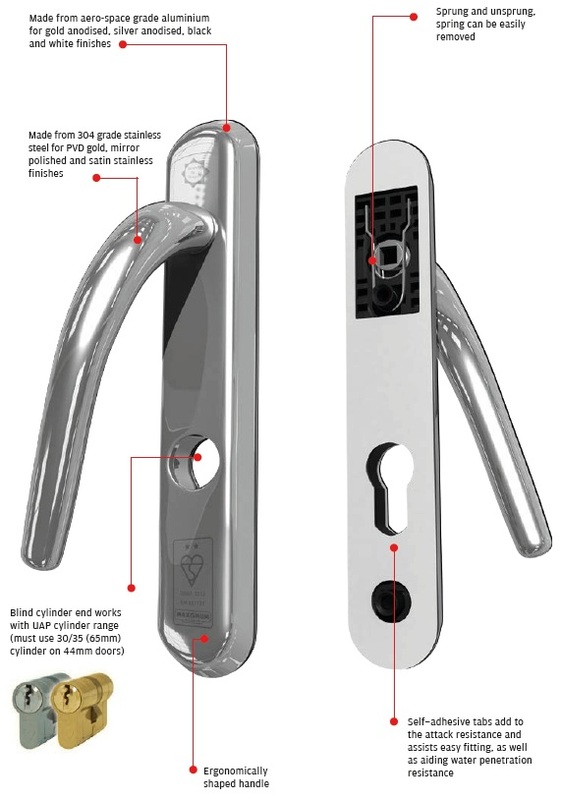 Once fitted onto the door, the door handle is developed so as to help protect from the most common break in methods, cylinder snapping and handle snapping. 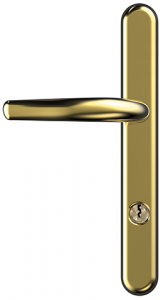 Polished gold, polished chrome and satin stainless front door handles have been developed from 316 grade stainless steel, and is part of the Nanocoast range of products. 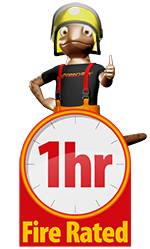 Each product in the Nanocoast range has been spray tested for 2,000+ hours to ASTM B117 to ensure durability, coming with a LIFETIME guarantee anywhere in the country. This door handle is ideal for coastal locations, where the salt in the sea air usually pits and corrodes door hardware products made from brass and zinc, and also in locations which are close to highly populated industrial areas! 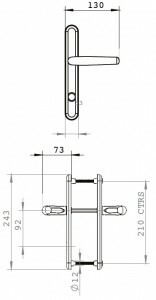 The MAX6MUM SECURITY front door handles are a fantastic option if you want to upgrade your front door security. 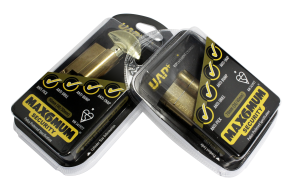 It is highly recommended that you combine the 2* Kitemarked high security front door handles with the MAX6MUM SECURITY 1* Kitemarked Euro cylinders, to offer you extra protection! 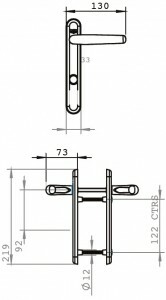 1 – You will first have to take off your old handles and spindle by unscrewing the 2 screws on the inside of the handle. 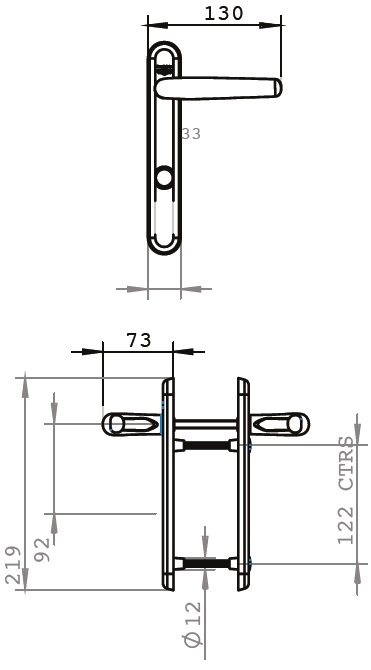 – Apply slight pressure to the opposite end of the cylinder so the cam (black latch in the centre of the cylinder) lines up with the cylinder body. 3 – Fit the new spindle from the handle set into the lock to replace the old spindle. 5 – Turn the lever of the handle left or right depending on how the door opens. Fit the outside handle over the spindle, making sure the spindle also goes through the spring cassette. You may have to wiggle the spindle to open the spring jaws slightly. 6 – Push the handle towards the door and when the handle is straight, remove the paper backing on the self-adhesive tab and press the handle gently again the door. The self-adhesive pad is an important part of the protection system. 7 – Repeat steps 5 and 6 with the internal handle, but do not remove the paper backing. 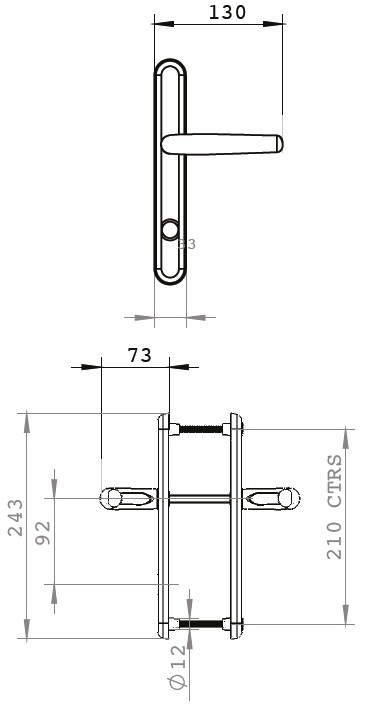 8 – Insert the 2 bolts supplied into the external handle, and turn the bolts 3 or 4 full times to ensure they are lined up with the external handle correctly. 9 – Insert your new cylinder into the handle (see instructions below) and make sure that it is fitted the correct way around. 10 – Once everything is lines up, remove the paper backing on the self-adhesive tab on the internal handle on the self-adhesive tab (use a Stanley blade to make it easier to peel). 11 – Make sure the internal handle is straight, and push it gently against the door. Full tighten up the 2 bolts. 12 – Make sure the door handles work smoothly, and the new lock also works smoothly. 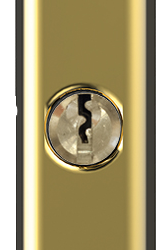 – Place your new key into the new cylinder. – Turn the key approximately 30 degrees either clockwise or anti-clockwise (either at 10 or 2 o’clock) so the cam lines up with the cylinder body. – Slide the cylinder into the door. – Place the new retaining screw into the door’s fixing hole, and use a screw driver to tighten so it is secure. Your door handle should give you years of trouble free use. However, once a month, wipe the door handle over with a moist cloth and remove any dust particles that may have accumulated. Pay particular attention to any moving parts, and finish off by wiping the door handle with a lint free cloth. We guarantee that the above products will not fail mechanically in normal use during the 5 year guarantee period subject to the conditions outlined above.